Striking similarities between this game and the Saints' round 2 win over the Suns when the score was 47139 and this evening, the Saints win by 95 as Riewoldt bags 7 and the Saints rocket in to the 8! GOAL SAINTSGreat ball movement from the Saints as Goddard runs on to the bouncing ball and feeds it back out to Siposs who snaps around his body from 40m and snaps truly! Margin is 95 points! GOAL SAINTSGilbert marks at CHF, looks up and sees Milne by himself about 45m out. From directly in front, he likes it off the boot and why wouldn't he!? A lovely kick and he drills his 2nd. BEHIND SAINTSMontagna on the run has a shot at goal from 35 but misses. GOAL SAINTSSchneider from hard up against the boundary line centres a lovely kick back inside and Koschitzke clunks a strong grab in a big pack of players. No problems as he slots his 3rd. BEHIND SAINTSThe Saints work the ball from defence and through the middle with ease and a long kick inside forward 50 finds Milne on the chest. Milne hangs his shot out right. The diagnosis for Saad is just concussionmuch better news than any fracture to his face or any injury to his neck. BEHIND SAINTSGilbert scores a behind from 35m under pressure and the lead is now 75 points. BEHIND SUNSAblett chips a pass inside 50 and Matera marks all alone 45m out. He slips as he kicks the ball and it is punched over for a minor score. GOAL SAINTSDempster drives a long ball to the danger spot and guess who is waiting at the top of the square? Riewoldt takes the grab on his chest. He bags number seven! Warnock shanks a defensive kick out on the full and Milera will take the free from the boundary about 35m out. He pushes it across the face and fails to score. GOAL SUNSMatera drives the ball inside attacking 50 and is bumped after the kick and the downfield free is awarded to Rischitelli. He pokes through the goal from 30m out. Six minutes in to this term the possession count was 311. Crazy! The Saints have completely owned this quarter so far. BEHIND SAINTSThompson, deep in defence, turns the ball over as he hits it straight down the throat of Gram. Gram pulls his shot left from 40m. More like a training drill for the Saints at the moment as the pressure from the Suns has completely dropped off and the Saints are doing as they please. GOAL SAINTSGoddard marks in the left half forward flank and drives the pass lace-out for Milne. Milne, from 40m, nurses his kick through the big sticks and the lead has blown out to 74 points. GOAL SAINTSSteven spears the pass inside attacking 50 and Riewoldt on the lead takes the chest mark and will line up for number six. From 35m out, he nails it! What a performance by the skipper! BEHIND SAINTSA turn-over directly from the kick-in as Siposs takes the mark and will line up from 50m from dead in front. He drives it long but is just off line. BEHIND SAINTSSteven dribbles a shot at goal along the ground from the pocket but it is rushed over the line for a behind. The final quarter is underway and the Saints will secure the win this evening as expected and it's just a matter of by how much. 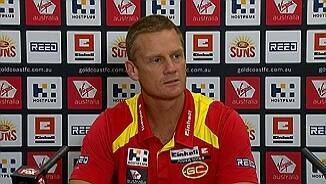 This term is all about respectability for the Suns. The siren sounds after a long quarter due to the injury to Saad and the Saints have this game in the bag, leading by 10 goals at 3QT. BEHIND SAINTSRiewoldt hands off to Milne who snaps around his body for another minor score. BEHIND SAINTSMilne dribbles through a behind with one and a half minutes to go in the quarter. GOAL SUNSTape pumps a kick inside forward 50 - a kick in hope - and Hickey flies in and clunks a fine grab. From 35m and dead in front, he drills the major and reduces the margin to 58 points. BEHIND SUNSDay from the wing boots the pass inside forward 50 and Russell slides in to take the grab 40m out on a very tight angle. He hits it right and that's where it stays. GOAL SUNSHall runs along the boundary line toward goal and he drags his kick around the corner and back inside to Hickey. Hickey pops through his first from 25m out. Margin is 65. GOAL SAINTSThe Saints pump the ball forward again and here comes Koschitzke as he juggles the grab 20m out. The Saints are doing it easy! He bags his 2nd from point blank range. The lead is 71. GOAL SAINTSBlake sends the ball inside 50 from the wing an is collected by Hickey after the kick and the free is awarded to Kosi downfield, 40m out on a slight angle. Kosi sinks the major! Schneider has been activated and obviously Saad will take no further place in the game. The doctors take their time for precautionary measures and we hope it's not a serious injury to Saad as he is cheered off the ground for his courage with his neck in a brace. Saad and Caddy collide just before the St. Kilda behinda head clash - and Saad has come off second-best and he is down as the doctors attend to him. The stretcher is out on the ground. BEHIND SAINTSKosi soccers through a behind from 20m under pressure. GOAL SUNSBrennan wins possession in the middle of the ground, there's no-one inside attacking 50 for the Suns, he sizes up the sticks and spears it home for a great goal. Something to cheer about. BEHIND SAINTSThe Saints win the centre clearance and the kick heads toward the Riewoldt direction and he stands tall to take a brilliant overhead grab in the pack. From 25, he hits the post. 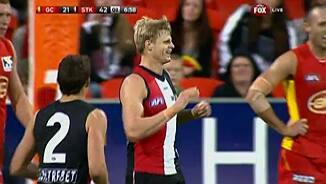 GOAL SAINTSNewnes boots the kick inside forward 50 and Riewoldt juggles the overhead contested grab. He is on song today! From 35, he splits the middle for number five! Saints by 63. GOAL SAINTSFrom the throw-in deep in the Saints' forward pocket, Steven roves it beautifully and bananas through a lovely goal under no pressure whatsoever. Saints are out by 57 points! BEHIND SAINTSRiewoldt feeds the ball back inside to Gillbert who steadies and fires at goal from 35 on the run and slams his shot in to the post. GOAL SAINTSMilne hits the kick to the top of the goal-square and Thompson gives away the free to Riewoldt for a hold. As easy as you like for the Saints' skipper and he has four to his name. BEHIND SAINTSThompson soccers through a rushed behind and that was very close to being deliberate but it is given the all clear. BEHIND SUNSHickey gives off the handball to Bennell who races past, unwinds from 50 and misses to the left. Poor kick under no pressure. The Suns are finding the footy but continue to turn it over when they go inside attacking 50 with very poor disposal and poor decisionmaking. Scott Watters confirmed during the break that Kosi just tweaked his ankle and is fine. Very good news. The third quarter is underway. Brown was subbed out of the game for the Suns just before halftime and so Shaw has been activated. So the Saints boot six goals to the Suns' two and take a big 44point lead in to the main break and are in full control of the ball-game. GOAL SAINTSNewnes marks 50m out dead in front and goes very wide across the ground to find Blake five metres closer but on a much harder angle. Blake thumps it home for a ripper on the siren! BEHIND SUNSAblett wins the clearance as he hacks the kick forward out of the centre and McKenzie takes the grab low to the ground. McKenzie pulls his shot wide from 50. GOAL SAINTSSiposs hits the ball inside 50 from the left half forward flank and Sadd takes a solid overhead grab on the lead, 35 out. On a 55 degree angle, he guides it home for his second in a row! GOAL SAINTSNewnes spots a player inside attacing 50 and it is Sadd who takes the mark on his chest, 35m out on a slight angle. He strikes it well and the kick sails through for a lovely goal. GOAL SAINTSAll of a sudden the Saints are out by 27 points as the ball comes off hands inside the Saints' forward 50, it spills to Dal Santo who rolls it through from the pocket for another one! GOAL SAINTSRiewoldt brings the ball to ground in the marking contest deep in the right forward pocket, it rolls forward and almost accidentally, Riewoldt pokes it through off the deck! His 500th! BEHIND SAINTSRiewoldt gathers the footy and gets boot to ball close to goal while being tackled and he hits the woodwork. BEHIND SAINTSDal Santo hooks a shot at goal from 45 but pulls it well left. The Suns' defence is holding up well at the moment and has restricted the Saints to just the one goal this quarter. 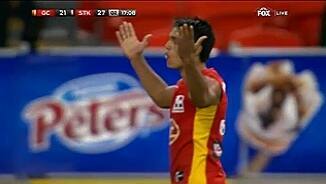 BEHIND SAINTSSiposs is caught high by Ablett and he will line up for goal from just outside 50 on a 45 degree angle. His shot is out to the left for a behind. The pressure from the Suns has no doubt lifted in this quarter and the Saints will need to up their intensity to maintain their advantage and increase it further. GOAL SAINTSMilne is lucky not to give away the free for holding the ball as Steven gives to Hayes hard up against the boundary line and he centres a chip-pass 15m inside to Milera. Goal. GOAL SUNSA quick centre clearance from the Suns as Hall gathers inside attacking 50, slams the ball on to his boot and it floats through for another one to the Suns! GOAL SUNSMcKenzie wins the free and shorts the pass inside 50 to McQualter who quickly plays on and finds Stanley even closer. He lines up from 35 and slots the goal. Good start Suns. The second quarter is underway and Gram is currently leading the disposal count with 12 to his name in that first term along with six marks. 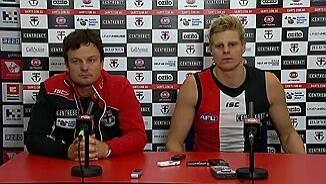 Riewoldt has two goals already; one shy of 500. The siren beats the Saints for another chance at a score and they have eased their way out to a threegoal lead at the first break. BEHIND SAINTSGram launches a shot from 50m on the run under pressure and his shot sails wide for a minor score. The rain begins to tumble as we approach quarter time. The Saints have loose men all over the ground and it looks like they have about five extra players on the field. GOAL SAINTSMilera speeds through the middle, runs his full measure and then with a lovely lace-out pass hits Steven on the chest. His shot from 40 on a 45 degree angle is splendid. Saints by 17. BEHIND SUNSBennell unwinds from 52m on the run but hooks the kick to the left for another minor score. BEHIND SUNSBrennan with a wonderful mark at centre half forward and he spots Hickey 40m out dead in front. He hangs his shot out to the left. BEHIND SUNSIles takes the mark 48m out, wastes no time as he plays on, unloads from 50 and pulls it right. Plenty of space for the Saints to work in all over the ground and the pressure from the Suns is nonexistent. GOAL SAINTSClarke takes the chest mark 52m out directly in front. He decides to play on, sizes up the sticks and hammers home a beautiful goal! Saints lead by 14 points early. GOAL SAINTSA lovely kick from Gilbert in the middle to Riewoldt who takes the grab just inside 50 on a 45 degree angle. He pumps it long and strong! Goal number 499 for the Saints' skipper. Koschitzke is back on the ground and straight in to the ruckgood news for the big man and the Saints. GOAL SAINTSGram heads to the danger spot from the right half forward flank and Riewoldt on the lead takes the grab and is awarded the free anyway. He steps around to reduce the angle and goals! BEHIND SAINTSIles is caught holding the ball and Saad will take the free from 50. He chips it inside and hits Siposs 35m out directly in front. The kick fades late to the right. GOAL SUNSThe kick forward from Sexton around the body and Brennan leaps in the left forward pocket to bring down a great grab. He slices it right through the middle from 25m! The Saints look a bit lackadaisical and have wasted some chances inside 50 early on in this game. BEHIND SAINTSJones to Steven in the goal-square but they mess it up and it is rushed over for a behind. Koschitzke has pulled up sore in a marking contest and immediately come off the groundpossibly a groin injury. The Saints demolished the Suns back in round two by 92 points and will be looking to repeat that feat today. The Suns certainly have other plans. The subs: Schneider and Shaw. And we are underway! Welcome to Metricon Stadium for the clash between the Suns and Saints. Two late changes for the Saints: Ray and Cripps are out and Clarke and Schneider are in. The Suns line up as selected.